These days, you don’t have to be a hippie to go the green route. Climate change has been made public knowledge, and more and more people are now getting into the habit of finding ways to help preserve the earth. Luckily, we have a lot of resources available to help us figure out exactly what we can do to save the planet without disrupting our daily lives. The best place to start is at home and we’re fortunate that going green doesn’t mean having to compromise style, either. Here are some nifty ideas for jazzing up your windows the sustainable way. With heavy drapes or window film, you can help regulate the temperature inside your home and significantly reduce your heating bills in the winter and your cooling bills in the summer. Some window films can even go as far as preventing harmful UV rays from entering your home. Unless you suffer from headaches caused by bright light, one of the most eco-friendly ways to use your windows is by keeping them free from obstructions. Use the sun’s natural light to save on lighting bills and use the sun’s warmth to stay toasty. 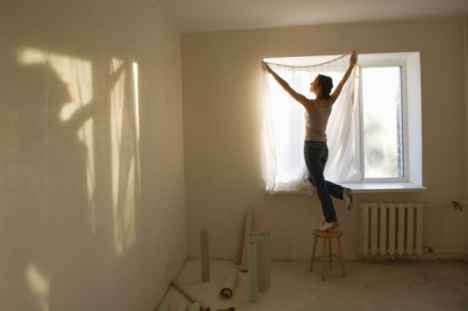 All you have to do is invest in some window film for your big window and leave it at that. Cotton can also work as a great window treatment, barring any chemicals or toxins it might have gotten from processing. Natural fibers are great thanks to their biodegradability and are versatile enough to adapt to whatever style you have in mind. Take a bit of caulk to make sure your windows are properly sealed. You’d be surprised at how much energy you’ll save and how effective it is against air loss. It may be easier and much more convenient to buy brand-new window treatments but it has gotten much easier to find recycled curtains and blinds these days. You help beautify your home while preventing more materials from getting dumped into landfills. You may even repurpose an old bed sheet and turn it into a curtain or runner. Take note of curtain colors especially when dealing with heavy drapes because darker colors absorb heat much faster than light shades and will quickly heat up your home in the summer months. When properly sourced, wood isn’t just a handsome window treatment; it’s a great alternative to other materials. One of the most popular choices for wooden window treatments is bamboo due to its rapid growth and durability. However, if you manage to find a supplier of wood that practices sustainable yield forest management, you may use cedar or whatever you choose. If you’re unsure of what type of wood to go for, your best bet would really be bamboo. To play a role in helping to preserve the environment, you don’t have to go to extremes and live off the grid. With a bit of elbow grease and ingenuity, you can go green at home without sacrificing comfort. Tammie Braunson is a professional blogger that shares the latest on architectural decorative glass. She writes for Imaging Sciences, a top company for producing architectural decorative glass panels.